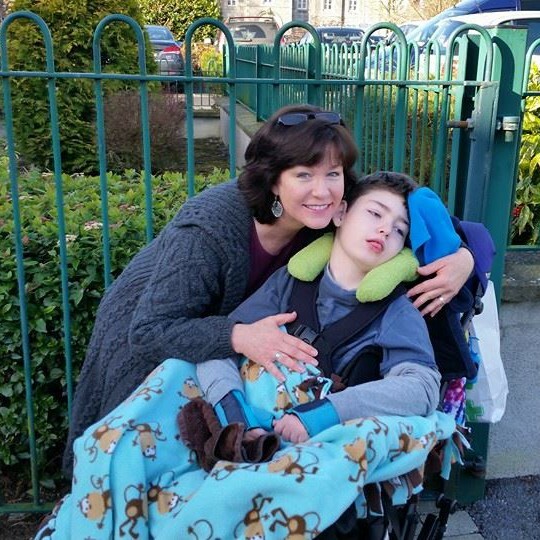 This journey with a child who has a life-limiting illness is incomparable to any other parenting journey. Friends, family, and even the bold stranger may try to tell us otherwise. You know, the line about how it’s just like having an infant? But we know. Our tired, aching, shattered soul knows. I am nearly 12 years on this journey with my beautiful, fragile, son, Brendan Bjorn. In the early days, I was filled with hope and encouraging thoughts as his potential was still yet to be fully seen. The months turned to years slowly revealing his path, and with that, the hope faded as reality set in, dawning like a new sun as each round of near life-ending illness occurred and found him weaker and more fragile yet again. Another seizure, another cessation of breathing requiring paramedics to bag him, hoping to change the blue of his skin to pink again. Another stay of weeks on end in hospital as doctors try to figure out what to do to save his life – even if for just a little while longer. Parents on this journey are tired, and I don’t just mean that we don’t get enough sleep…although that is surely an accurate statement! Our souls are tired. Why? Because we fight. Constantly. Internally and externally. We fight to balance acceptance of reality that our child will die while maintaining a positive, loving attitude that is actually sincere and not just put on for public consumption. Some days, that can be a very tall order. We fight for services that our child deserves from governments, organisations, schools, therapy departments, and a myriad of other related areas. It is an endless battle complete with mountains of paperwork, phone calls, documentation, appointments, all which take time and energy we simply don’t have much of any more. We fight for our own health, which is difficult to do when we are the ones usually put last on the list to care for behind our fragile child and our other children as well. Our backs begin to give out from lifting and carrying our child every single day for years upon years. Our body’s immune system weakens from lack of sleep and constant stress, taxing our already low reserve of energy. Yet we cannot give up or give in, no matter how we feel. We fight for our own mental health as well. Depression and anxiety going hand-in-hand to create a whirlwind of emotional struggle within our aching bodies and minds. Sadly, this is an area that usually gets overlooked, or brushed under the rug, by professionals and the like. It is down to us as individuals and as a collective group to look after ourselves. And we must be vigilant in this regard! We fight to remember who we were as an individual before this life took us over. A career left behind. An education put on hold. A much loved hobby forced to be discarded. Friends we haven’t had a chance to see for months or even years. A life now a distant memory. We fight for respite, for time to replenish our souls. Time that rarely gets to happen. Refer back to the fight for services with the government and organisations that are to be providing assistance. There simply is not enough available. The services simply aren’t provided. We fight for understanding, basic understanding, from our spouse, our other children, our friends, our family, the doctors, the teachers, the elected representatives, and even from other special needs parents whose journey is not quite the same as ours. And maybe we even fight to understand ourselves, being somewhat at a loss within. Nearly 12 years on this journey and I am tired. My soul is tired. I am not afraid to admit it, and as a writer and a professionally trained mental health counsellor, I say this freely in hopes to help other parents on this journey. That is why I write. That is why you see this now. So yes, I admit, my soul is tired. I watch my son face his challenges every single day, and while I am in absolute awe of him, I can admit it wears on my soul. My life revolves around his care, which I provide 24/7. I wake each and every night around 1am to turn off his feeding pump and unhook the line from the peg in his stomach. I measure his life saving medications morning and night. I lift him, carry him, bathe him, dress him, change him, comfort him. I do everything I can to give him all the care he needs and so rightly deserves. I love him, endlessly. I have been away over night from my son a total of 8 nights in the nearly 12 years. Two of those nights were while I was in hospital after operations ( but they don’t count, right?). So, that leaves 6 nights away in 12 years to try and get a bit of respite…to try to rest my soul. Is that enough, one asks? Should there be more respite services to give my 50 year old body that aches with rheumatoid arthritis and degenerative discs a rest on occasion? I ask that somewhat jokingly, but in all seriousness, the answer is yes. And I will continue to fight for that respite for not only myself, but for other’s in my shoes, because we need it in order to continue on fighting and caring. Indeed, I will continue to fight, just as all the other parents on this journey with their child who has a life-limiting illness will do. We will fight on all levels, with all we can muster, because that is what we must do…even though our souls are tired.